A bolter shot hits and wounds a Warlock on a Jetbike, he needs to make a 3+ armour save to survive. If the farseer had cast Fortune to give him a reroll on that save, how much more likely would he be to survive? and would he have been better off in Terminator armour instead? Rerolls don’t change the range of possible results (i.e. 1-6) but they do change odds of a particular result. I’m following the usual format for the percentage odds here so I won’t labour the discussion with what each row means. Well actually … it is a little different this time so perhaps I should give some explanation to the more interesting bits. The ‘equals’ row gives the odds of a particular result if you were to roll two dice and pick the highest. The ‘less than’ row shows the odds of failing a particular result, e.g. theres a 25% probability of failing a 4+ (rerollable). “So what?” says you. In isolation it’s not that insightful, but if we compare it to the odds of a ‘normal’ (i.e. not re-rollable) outcome it gets very interesting. The odds for a normal roll are covered here, but I’ve graphed the odds of success for normal vs rerollable to really show the difference. Ok so the odds of getting a 1 or better is 100% in both cases … duh. But what about that Warlock from the beginning? The jetbike Warlock has a 33.33% chance of failing that save (with no reroll). If the Farseer has done his job and put Fortune on that Warlock, then the reroll brings the probability of failure down to 11.11%. The reroll makes him three times less likely to fail! and what about that terminator armour? it has a 16.67% chance of failing that save – that’s twice as good as the basic Warlock, but one and a half times worse than the Fortuned Warlock! A fortuned jetbike Warlock has significantly better saving throws than a Terminator with a Stormshield – think about that before you try gunning down a Seer Council. Take a moment to really look at the chart. The rerollable 6+ is almost as good as a basic 5+, and is about twice as likely as a normal 6+. The 5+ reroll is better than a basic 4+, and so on until they converge at 1. Also notice those trendlines I’ve added, the basic rolls get linearly less likely, but the rerolls stay high and then gradually fall off as you hit 6. This entry was posted on Wednesday, March 30th, 2011 at 10:44 pm	and tagged with 1d6, 2d6, 40k, fortune, master crafted, probability, reroll, statistics, Warhammer 40000 and posted in Probability. You can follow any responses to this entry through the RSS 2.0 feed. Interesting stuff, how do you feel about weirder rerolls like master crafter where if you have say a heavy 4 weapon at BS4, does one reroll suddenly make it better than BS5? Great question. For multi shot weapons it does get a little different, but you can treat each shot as an individual case and so the same improvements are still there. But if you only get a reroll on one of the shots, then the benefit diminishes as your number of shots increases. Where my analysis falls apart is if you get into rolls that don’t have a strict ‘pass/fail’ such as vehicle damage rolls, or any roll where the reroll could produce a worse result than the initial. But those situations are unusual enough not to really warrant analysis – well not yet anyway! I am also intrigued by the nature of characters with high BS. The Assassins are a perfect example. The Vindicare has a 50% chance of hitting with the missed shot. BS 8 requiring a 2, followed by a 4. What are the odds of that missing? Another great question – clearly only the smart kids are reading my blog. So here we have a situation where the ‘reroll’ is not the same as the initial roll. So for a BS of 6 or higher you miss on a 1, but depending on how high your BS is you get a reroll. This goes from on a 6 if you have BS 6, getting better as your BS increases up to a 2+ reroll for BS 10. Because the initial shot only misses on a 1, the simplest way of thinking about it is in terms of how the reroll changes your overall chances of failing. Let’s use the example you cited of the Vindicare. The odds of him missing the first shot is 16.67%, but then he gets the reroll on a 4+ which has a 50% chance of success. To get the overall odds we simply multiply the initial odds of failure by the odds of failing the reroll – so for the Vindicare that’s 16.67% times 50%, gets you 8.33%. So the Vindicare has over a 91% chance of hitting. You can do the same calculation for any of them. So BS 7 gets you a reroll on a 5+, you have a 66.67% chance of failing that reroll; so your overall chance of missing is the 16.67% times 66.67% which gets you 11.11%. Or in other words an 88.89% chance of hitting. In terms of how this relates to the graph I put up, take a look at the 2+ columns. 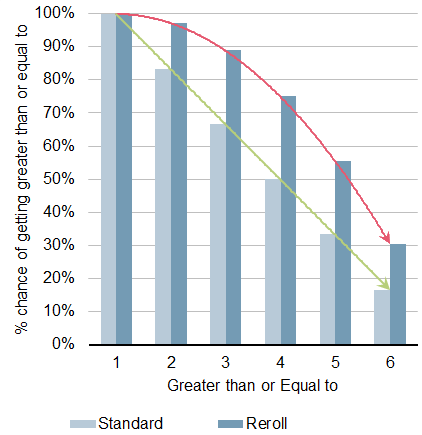 So a straight 2+ no reroll is circa 83% likely to succeed. A full 2+ rerollable is about 97% likely to succeed. Those rerolls for BS 6 or over are basically taking you in steps from the 83% up to the 97% (i.e. the reroll for BS10 is basically just a straight 2+ reroll). Hope this answers the question!